Speak Schmeak: Fill this. . . It's time I wrote a little something about fillers again, because this issue comes up so frequently. Last time I wrote about following rules for the sake of rules, Jeff from MostToast.com made a great point in the comments when he said that just counting the number of "ums" doesn't necessarily indicate whether they're a problem. So the other day, I was reading a public speaking article and the writer suggested that, the next time you attend a presentation, you should keep track of how many times the speaker uses certain filler words. And I thought to myself, "Really?" This is how I should spend my time during a presentation? Not listening for the value the speaker has to offer me, but to listen for how many times she says, "uh?" 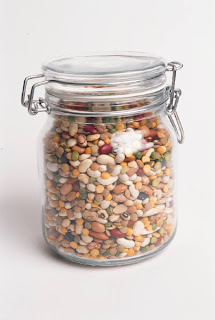 This reminded me of another post, on John Spaith's blog, where he talked about his Toastmaster group throwing beans into a jar for every filler word the speaker uses. First of all, it's distracting rather than helpful to the speaker. Second of all, it's distracting to the listeners. Third (of all? ), what about all the other things the speaker might be doing that need to be corrected? Giving such emphasis to "ums," "uhs" and "likes" makes fillers seem ten times as important as eye contact, voice, movement, content, connection, authenticity, and all the pieces that, together, make a good presentation. Here's my point: Be aware of your fillers, try to eliminate them if you can. But don't give them so much importance in your speaking that you neglect all the other things that make a powerful and effective presentation. And PLEASE do not sit in the audience counting the speaker's fillers. You've got better things to do with your time. Like listen and learn. There is also some research (e.g. Jennifer Arnold but also from others) which indicates that 'uh' and the likes might actually improve the understanding of difficult parts of a talk. Of course that doesn't mean you should use 'uh's on purpose, but that they are not at all as bad per se as some make you beleive. That's interesting, Michael. I'd love to track down that research. 1. Disfluencies Signal Thee, Um, New Information by J. Arnold et al. 2. It’s the way that you, er, say it: Hesitations in speech affect language comprehension by M. Corley et al. I have writte a small blog post about this, however it is in german. That's really interesting research. It makes sense that if most people use filler words when they speak, that those same cue's in another's speech would trigger the same thought patterns. Especially when a similar presentation is given regularly for a long period of time, a "mechanical" feel can be created - it's "over-perfected". It's especially likely with something like a sales presentation or orientation training that is given often by the same person. Those little mistakes, stumblings, and errors in a presentation make the presenter much more relateable. It's the human element. Thanks for the links, Michael. I'm off to see how much the translation site butchers your blog post now. Brandon, I think that is a key issue. We want to be seen as human, not overly polished, robotic, mechanical and memorized. Those little speech flaws serve a purpose. Great post, Lisa. You know, in normal conversation we accept all manner of fillers without objecting. In fact, most times we're barely, if ever aware of them. And since the best presentations are really just conversations, it shouldn't matter about fillers, as long as they're not excessive. Lisa, this reminds me of a TV interview I saw here in the UK back in the 80s. There was a great jazz drummer (I think it may been Buddy Guy) who was asked what he thought of the emerging trend for programmed electronic percussion instead of the real thing. He replied that it was a human drummer's 'mistakes' that made music interesting. It's funny -- At times I find myself counting ah's during presentations. I agree that filler words are not too bad, it's when they are combined with other blaring weaknesses. I do differ on one point. What's distracting is listening to a speaker where every other word is a filler word (ah's, ums). This may cause some in the audience to lose interest or starting counting ahs. My toastmaster club doesn't use the bean in jar exercise, but we do use something that makes a slight audible sound to help reduce ah's. Our practice is not to 'ring' speakers during prepared presentations. Lisa..thanks for all the great information you make available. I'm definitely linking up to your site.